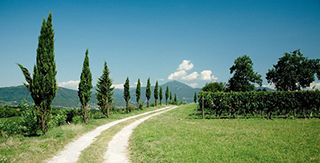 This popular festival is an opportunity for the visitor to get to know the Franciacorta wine area by walking/ cycling/ bus on the wine route visiting castles, monasteries and wine cellars in a weekend full of events and good food and wine. The wine cellars will be open from 10am to 1pm and again from 2pm to 7pm all weekend, booking essential. 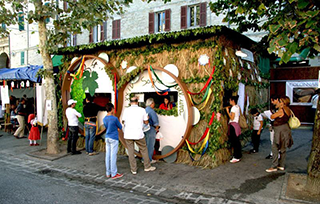 It is the most important international event dedicated to food and gastronomy. A great multi-faceted event: the MARKET, with exhibitors from five continents and the SLOW FOOD PRESIDIA, numerous EVENTS dedicated to the wealth and diversity of global cuisine, street food, the prestigious ENOTECA, CONFERENCES examining issues around food production, the FORUMS of Terra Madres FOOD COMMUNITIES and more, all with the aim of loving the earth. Together, we are learning more about how our food is made, preserving biodiversity and securing a better food future for everyone. Parma Ham and Parmesan Cheese, Fossa Cheese, Balsamic Vinegar, Lambrusco wine, these are only a few of the incredible foods on offer in Emilia Romagna. 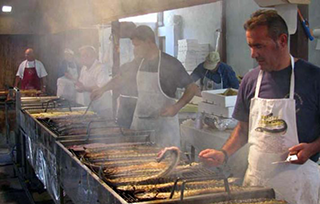 In autumn and early winter there is a variety of events to tempt the gourmet visitors: Valtidone Wine Fest near Piacenza (Sept), Fossa Cheese in Talamello (Nov.), Olive oil in Coriano near Rimini (Nov.), Fish Festival in Cesenatico (Nov), Eel Festival in Comacchio (Oct), White Truffle in SantAgata Feltria near Rimini (Oct) and the November Porc, a celebration of Parma Ham, Culatello, salami and more. 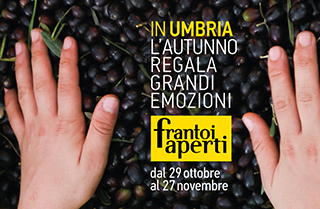 This is one of Italy s oldest grape festivals and takes place over 4 days culminating on Sunday 2 October. The rich program of events is a celebration of local traditions, culture and wine making with traditional dances, songs, music, allegoric floats and the Palio of the Verdicchio Wine, a grape crushing race. Stalls sell food and wine, grapes and other local products. The charming Medieval part of Certaldo in Tuscany holds every year a food and wine fair to pay homage to the great writer Boccaccio, famous for his love of food and the good life, who was born in the town. 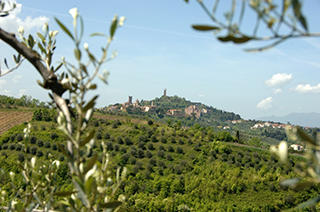 Food stalls, wine tastings, music and shows will entertain the guests in this beautiful corner of Tuscany. This will be the 23rd edition of the annual delicious appointment in the lovely town of Perugia for all lovers of chocolate, professionals in the field and importers. Tastings, exhibitions, workshops, shows for the 10 days of the duration of this festival. This year, the event is called Sharing Chocolate and it is inspired by the passion of sharing the delicious food with friends, family and loved ones. 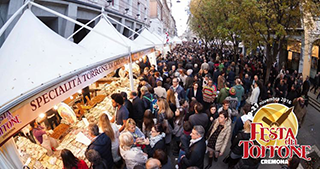 Acqualagna s central square, Piazza Mattei, hosts the Fair with over one hundred stands, where you can buy fresh truffles and other local quality products such as cured meats, wine, honey and cheese. The town has been recognized as the Capital of Taste, thanks to its quality products, tradition, history and authentic flavors. The white truffle is the most valuable on the market in terms of its nutritional properties and price. 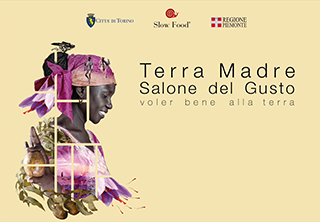 This will be the 86th edition of this popular fair dedicated to the extraordinary delicacy that is the Alba White Truffle. 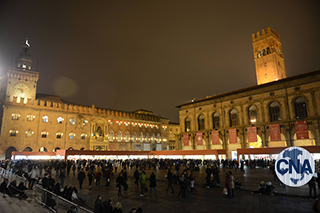 A myriad of events spanning from: cinema festival, medieval representations such as the Palio degli Asini (2 October), beauty contest, wine tastings of the famous Barbera and Barbaresco wines, food-related events, theater, music to culminate with the world famous Truffle market for the best and biggest truffle. 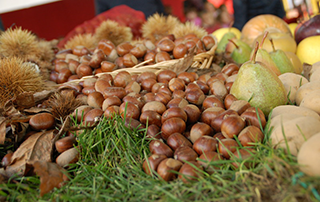 This is the 18th edition of the National Chestnut Fair in Cuneo. 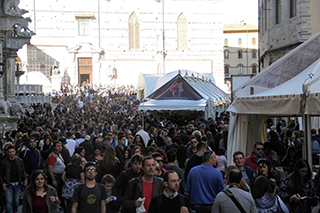 The event fills the old town with tastes, aromas, sights and sounds for four full days and attracting exhibitors from all over Piedmont and beyond. 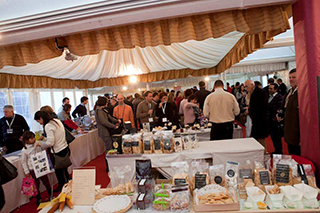 This will be the 28th edition of this event, the biggest in Friuli Venezia Giulia for food and wine lovers. There will be a series of tastings of regional food in the many restaurants participating to the event, wine tastings, workshops, seminars and other events related to the theme of the festival. Information, culture and the social world of wine are united at the Kurhaus, the famous Art Nouveau building in the heart of Merano. Fine wines and haute gastronomie are brought together with the simple unifying idea of true excellence. 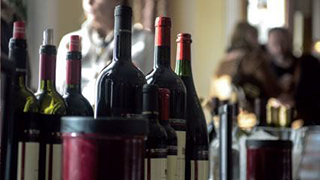 More than 500 selected Italian and international vintners and over a hundred producers of the very best in gastronomy are at the heart of what is on offer here. The 19th edition offers 5 fabulous, not-to-be-missed weekends for rediscovering a truly one of a kind product, extra virgin olive oil. Loads of events will be hosted along the Oil DOP Road during the extended edition of the Open House at the Oil Mills. 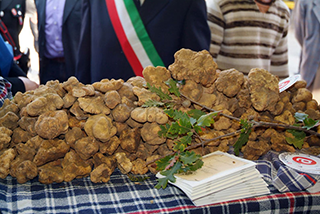 As one of the most productive truffle-rich areas of Europe, San Miniato hosts the 46th edition of the White Truffle Exhibition. 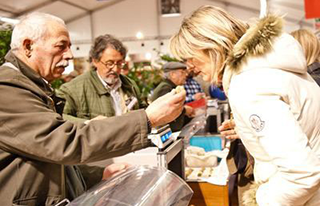 The festival offers the opportunity to taste traditional recipes made with the precious white truffle, buy traditional Tuscan products and take part in a truffle hunting. Torrone is the sweet nougat typical of Cremona, now famous all over the world. This year Cremona dedicates 9 days to its delicious creation with stalls selling all types of torrone, shows, music, historical re-enactments, typical Cremonese meals to be enjoyed in the many restaurants of the city and the construction of a giant torrone in the main piazza. Ciocco Show in Bologna is a major event dedicated to chocolate and pays homage to the food of the gods: a schedule of tasty treats, fun, culture and shows, with an eye to fair trade, to promote a shorter supply chain (from cocoa to chocolate) and ensure that the right compensation is paid to raw material producers. 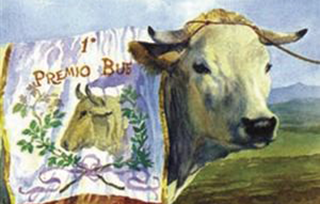 The Fat Ox Fair is an irresistible event, a living mix of local traditions, excellent food, competition, good wine, colourful people from bull breeders to bull buyers, markets and emotions held in the picturesque Langhe wine region. Eat the famous bollito misto to complete your day.